Holden keeps Stradlater company as he shaves to prepare for his date. Holden comments that Stradlater is a "secret" slob, who is handsome but has personal habits as dirty as Ackley's. Stradlater's "secret" slobbery is a sign of phoniness. He's pretending to be something he isn't. Stradlater asks Holden to do his English homework for him. Holden asks Stradlater who he's dating. When Stradlater doesn't immediately tell Holden, Holden puts him in a half nelson. Stradlater is a phony user. Holden's response shows his anxiety about dating. The half-nelson seems socially inappropriate. Though annoyed, Stradlater says that his date is Jane Gallagher, whom he mistakenly calls "Jean." Holden knows her, and goes on for a while about playing checkers with her one summer, but Stradlater doesn't seem to care. Eventually, he borrows Holden's hound's-tooth jacket, and leaves. Holden's story about Jane is childish and idealistic. In contrast, Stradlater is going on a date with her and cares more about her body than her name. Holden remains in the bathroom, uncomfortable with thoughts of Jane and the sexually experienced Stradlater together. When he returns to his room, Ackley again barges in. This time Holden's happy to see him. Holden thinks of Jane as being innocent. This image can't coexist with her dating Stradlater. Holden's pleasure at seeing Ackley shows his loneliness. Kestler, Justin. "The Catcher in the Rye Chapter 4." LitCharts. LitCharts LLC, 22 Jul 2013. Web. 9 Nov 2018. Kestler, Justin. "The Catcher in the Rye Chapter 4." LitCharts LLC, July 22, 2013. 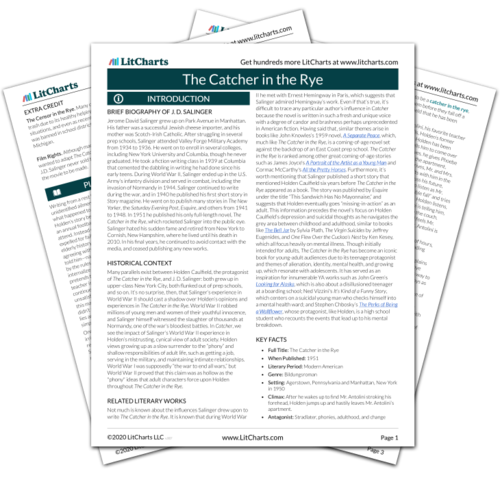 Retrieved November 9, 2018. https://www.litcharts.com/lit/the-catcher-in-the-rye/chapter-4.